Workplace Matters | Listen Free on Castbox. For many, workplace is taken for granted. It’s time it was given more attention. Workplace Matters provides fresh perspectives on the cultural, spatial and technological aspects of our workplaces, through thought-provoking conversations with fascinating folk who design, create, manage and work in them. 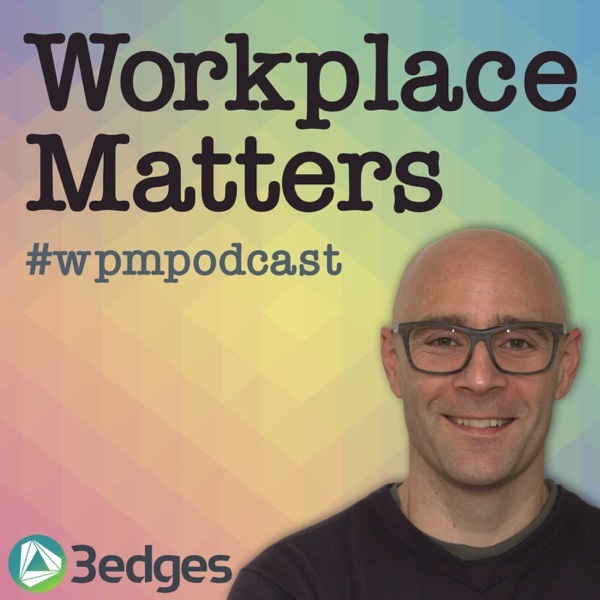 We're back with part 2 of the inaugural Workplace Matters Metacast, where Ian and James from 3edges are joined by i-FM.net editor Simon Iatrou and independent workplace specialist Will Easton, to explore workplace issues through non-workplace podcasts episodes. Very meta.If you’ve not listened to episode 15 part 1 yet then go do that first, or it might feel like you've walked in on a really interesting conversation halfway through. Because that’s exactly what you've done...Podcast episode selections:Will: The Walkman from The Pessimists ArchiveSimon: Our Computers, Ourselves from InvisibiliaIan: The Blue Yarn from 99 Percent InvisibleJames: Saigon 1965 from Revisionist HistoryBig overall themes include:How new technology affects us both individually and collectively - in the workplace and beyondHuman responses as both individuals and institutions (like for example organisations and governments) - predictable and otherwiseThe sorts of information and data we do (and don’t) respond toHow our level of involvement in something affects our ability, understanding and desire to changeAnd finally some key learning points from our round table reflections at the end of the session:The power of stories: the stories we tell ourselves, and the stories we tell othersThe importance of ‘narrative’ when it comes to anything to do with workplace - there has to be a message that resonates emotionally with peopleThe importance of leadership (not only management) in workplace changeFundamentally, is leadership about the management of meaning?The power of podcasts as an accessible, on demand, democratic learning tool... to listen to, share and discuss stories!Once again, don't forget to subscribe to our sparkling new Workplace Matters newsletter at 3edges.co.uk, and check out our Workplace Leadership Manifesto comrades, out daily during January on Twitter and LinkedIn. Search #WpLeadershipManifesto. Power to the people.And a huge thanks to the fantastic Kelham Island Brewery in Sheffield for hosting us. We’ve got something different for you this time - the first ever Workplace Matters Metacast. It’s a round table discussion between four podcast geeks: 3edges co-founders James Pinder and Ian Ellison, editor at i-FM.net Simon Iatrou, and freelance workplace provocateur Will Easton. It’s all about workplace. Except we’re not allowed to say anything about workplace unless we use an unrelated podcast episode to make the point. Like a game show without any prize... or something like that. Very meta. Hence the name.It’s a big discussion, so we’ve cut it in two. The intro and first two podcast examples are here. The final two examples and our wrap up learnings discussion will in episode 16, part 2, out tomorrow. Think of this as a gateway to more. There is so much great content out there to expand your horizons. Try things, go deeper, and let us know what you think @wpmpodcast on Twitter.Podcast episode selections:Will: The Walkman from The Pessimists ArchiveSimon: Our Computers, Ourselves from InvisibiliaIan: The Blue Yarn from 99 Percent InvisibleJames: Saigon 1965 from Revisionist HistoryDon't forget to subscribe to our sparkling new Workplace Matters newsletter at 3edges.co.uk, and check out our Workplace Leadership Manifesto comrades, out daily during January on Twitter and LinkedIn. Search #WpLeadershipManifesto. Power to the people.A huge thanks to the fantastic Kelham Island Brewery in Sheffield for hosting us. Ian chats with the sparkling Julie Kortens and Vic O’Farrell about the relationship between facilities management and workplace, what they’ve been up to since leaving the BIFM Board, and their fantastic ‘Choice, Chance, Change’ event on 23 November 2017 in London. ¡¡Spoiler alert!! “FM, we’ve always argued, it’s not the right descriptor… It’s bigger than that. Workplace is enormous”. Enjoy!